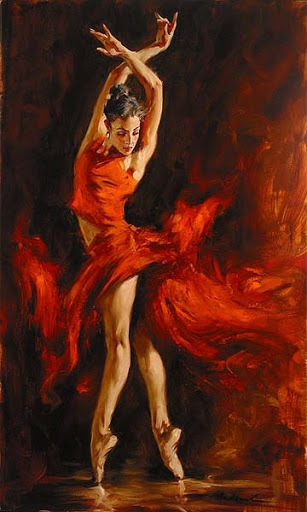 With the image of a Flamenco dancer woman on the cover of the pack of my first fine cigars I smoked, when I was fourteen, a teen, it’s like the first time you fall in love, you cough, and eye-watering, you discover what are cigars and women like, then you get the habits with them, with time, the comfort, the company, and then suddenly, and as always, departing is such sweet sorrow. She was a ballet-dancer, and I, a Fine-Arts student in Paris, later on, looking for a model, I discovered Degas, and pastels so delicate, and volatile, as she was, elegant and whimsical, that I spent hours and hours, watching her performing pirouettes, pas-de-deux, and grand-equart, so wide with your eyes opened that you can hung your Beret , and your hearth pending to her movements, holding your breath, a piece of chalk in one hand and a cigarette-Gitannes on the other hand the smoke-filled the air, and laughers, trying to fix that moment on paper, in despair, drawing as she moved, before it disappears, listening to Charles Aznavour_” La Boehme,” once alone, at home. The other day, at a corner of street, a vanishing scent of musk, and tabaco in the air, transported me to Paris, to the clime of lilacs trees, balconies and wisteria of Montmartre, it has been longtime that I quitted smoking, Quartiers-Latins, and its bistros, and moved to New York. They say, you rediscovered the subtleties of smells, perfumes, as you had lost your odorant sense while you’re smoking, they say, but what do they know about lost love? Othello , Shakespeare _”Depart is such sweet sorrow,” perchance. Posted in Poets, Promoting yourself and tagged arts arts arts arts arts aviation beauty blogging books climate creative current-events Food free God health heart home human-rights life literature love mental arts arts arts arts arts arts arts arts, Flamenco dancer, Frederico Garcia Lorca, Maria Rodriguez, paris, sweet sorrow. Bookmark the permalink. Read on ya later. Too nice to not read again later. I can imagine it all with you. Great quote! He was a smart guy, all right! You painted a beautiful, vivid picture. Thank you so much.